Fueling (recreational) exercise isn't difficult but, there are things you need to consider. If you are an evening workout person - I have written about that, too- catch that post here. Today's post is for those of you that rise and grind. For five years I was up early to fit in a workout and clear my head before the day began. I loved the mental benefits and the security of knowing that my morning time could not be taken from me. However, I constantly struggled with what to eat (if anything) before my workout. I won't lie, it took me quite a bit of time to figure it out. 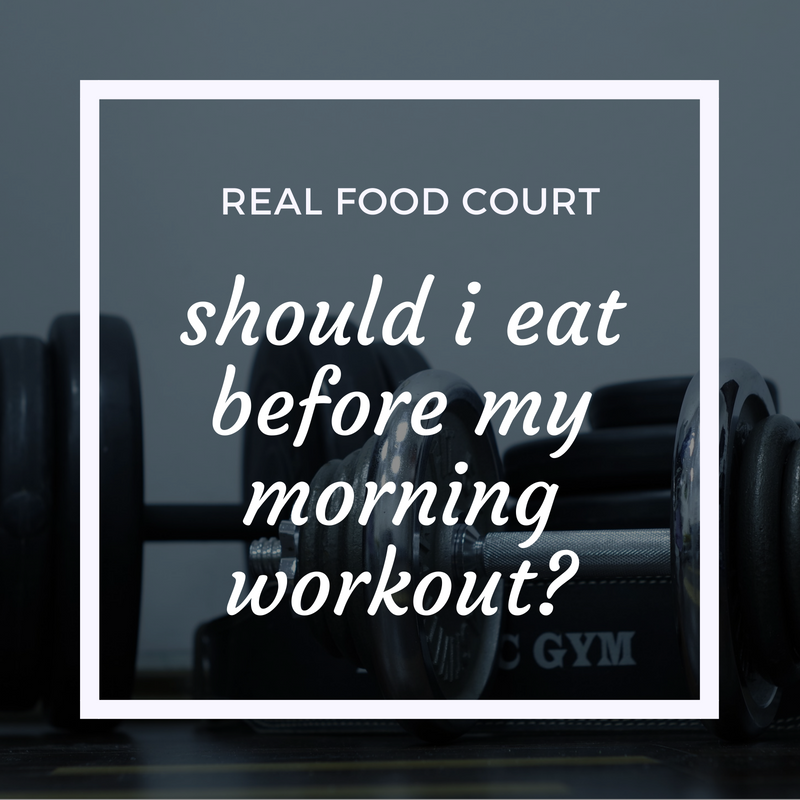 The goal of this post is to help take the guess work out of morning workout meals/snacks by providing some go-to guidelines. Although it may take you time to figure out what foods work best for you, I encourage you to experiment until you do. Ask yourself these two questions: What kind of workout am I doing? Am I hungry? what kind of workout am I doing? Consider intensity. For simplicity, I am going to break intensity into three categories: high, moderate, and low. I will give an example of what type of workout might fall in the category and how to eat for that intensity. If you exercise at a high intensity, such as CrossFit, circuit training, or weight lifting for strength, hypertrophy, or performance, you need to eat before your workout. High intensity workouts use weights to challenge your muscles or get your heart pounding and make you sweat (i.e. : hypertrophy, Crossfit, kettlebell circuit, fast paced superset routines, etc). Find yourself light-headed, dizzy, or nauseated during or after this type of workout? It means you need more fuel on board, particularly carbohydrates. This is the most common type of workout. Moderate intensity workouts (my definition) include circuits that use light or no weights and place demand on the cardiovascular system (causes fast heart beat and makes you out of breath). Examples include kickboxing class, plyometric workout, TRX, light kettlebell circuit, light lifting routine, spinning, and HIIT. With moderate intensity workouts, particularly those that will take at least 60 minutes, I suggest that you eat something. I would keep it small and very simple. Some fruit, a spoonful of peanut butter, or a few gulps of milk can do the trick. Keep in mind, your body knows best. If you are not conditioned to or used to these types of workouts you will likely need a larger amount of carbohydrates as your body will be burning more during and after to get you adapted to this new movement. You may experience some GI distress, in which case it might be better to not eat, and fuel up after. What works for your friend, may not work for you, try out different options to meet your unique needs. Low intensity exercise is great for your health and is my favorite way to workout at the moment. This includes yoga, pilates, barre, going for a walk or jog, any other cardio done for less than an hour. For low intensity workouts you don't need to eat. Your body should be able to use the stored fuel (carbohydrates stored in liver and muscles) from the day prior to get you through this workout. This is the most important question and one that must be considered. If you are hungry, you should eat, or eat more than you planned to. If you are getting dizzy spells during or after your workout that's a sign you need more fuel coming in. On the flip side, if you are getting an upset stomach that is a sign you may be eating too much, not leaving enough time between eating and starting a workout, or you need to choose a more simple item such as fruit juice or a date. Don't make yourself crazy over this - remember, you need to try things out to figure out what works best for you. Some fruit, a few bites of a granola bar, or nut butter should suffice as a great eat and go option if you wake up starving, but hadn't planned to eat. Make sure you eat a full breakfast post workout! Include a source of protein and carbohydrate and a bit of fat. Examples include an egg bake and a whole piece of fruit, overnight oats, oatmeal with a hard boiled egg, a smoothie with protein, or creative toast creations. If you find yourself extremely light-headed or headache prone after your workout, have something like fruit juice or dried fruit to consume immediately after your workout. This will bring your blood sugar to normal levels, and give your body something to use up during the after burn while you're getting yourself or your breakfast ready. For those of you concerned about how eating might hinder your physique goals, please realize that not answering your hunger and fueling improperly can only backfire on you. Your metabolism is working extra for quite some time post-workout, you need to feed that! More is more!! Individual questions or concerns? Comment or contact me here, would love to help you get the most out of your workout and take the confusion out of this topic! If you are an athlete training for a specific event, reach out, I can direct you to some great sports training focused RDs.